Many people believe that the best way to motivate others is with external rewards like money – the old “carrot-and-stick approach.” However, Daniel Pink the author of Drive: The Surprising Truth About What Motivates Us, believes that human motivation is mainly intrinsic. He believes people’s behavior is driven by internal incentives, and not external rewards. He argues against old models of motivation which were driven by fear, money, and rewards. The old theories of motivation are based on extrinsic factors. Those theories may have worked well in the twentieth century, however, it is not conducive with motivating people in today’s world. Pink believes we need to move past the carrots and sticks approaches, and need to upgrade to a new way of thinking. Extrinsic motivators like money and other external rewards worked well for twentieth century businesses because of the manual work and simple solutions of that era. Studies have found that for simple systematic tasks an external reward improved performance. The external reward narrowed the employee’s focus towards the answer, and pushed them to solve it quicker. However, because these external rewards narrow the focus and restrict possibilities, it makes it difficult for people to come up with creative solutions to complex problems. Hence, studies have also found if the task required any kind of cognitive function the higher reward decreased performance. Basically, the only time external incentives worked was when the problem was routine and the path to the solution was straightforward. The problem is that many workers in to today’s business world do not do the manual work with simple solutions that were done in the last century. They do much more complicated tasks with no simple answer. Daniel Pink has studied motivation for many years, and he has come to the conclusion that traditional ways of motivating employees do not work. His book is based on scientific research on human motivation. In his book, he points out there is a mismatch between what science knows and what business does. As stated above, studies have shown higher pay resulted in better performance only if the task consisted of simple mechanical skills. It worked for problems with a defined set of steps and a single answer. If the task involved cognitive skills, decision making, problem solving, or creativity, higher pay resulted in lower performance. Pink believes you should pay employees enough that they are not focused on meeting basic needs and feel that they are being paid fairly. He suggests that you should “pay enough to take the issue of money off the table.” Basically, pay people enough so that they are not thinking about money, but rather thinking about their work. 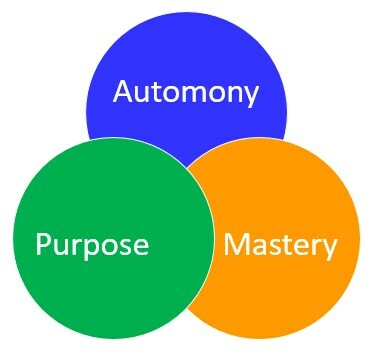 Mastery — the desire to continually improve our skills and become better at something that matters. Purpose — the desire to do something that has meaning and is important. Basically, to do what we do in the service of something larger than ourselves. People intrinsically want to do things that matter and make a difference.